The IBM FAStT500 is 2Gbps Fibre Channel storage server. Up to (224) low profile disk modules can be installed when using (16) EXP700 expansion enclosures. 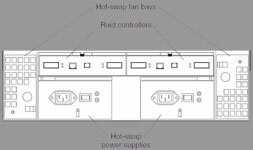 220 disk modules can be installed with (10) EXP500 enclosures. IBM's original specifications called for a maximum per-disk capacity of 146GB 10K or 73GB 15K. With the latest controller firmware and Storage Manager software, 300GB 10K and 146GB 15K FCAL disk modules can be used. Please note that, depending on controller firmware revisions and RAID levels, installing (224) 300GB disks may not be supported.